This post is dedicated to the Chatterjee clan who were courageous enough to substitute Biryani with Jire-morich-dhone diye Charapona Macher Jhol 😆! This particular dish was everything I didn’t like while growing up and is everything the patriarchs from my family liked! They knew which fish to pick, which veggies to buy and their wives knew how to cook the big fat batch of Macher Jhol! We the kids, liked it or not! They believe in my Parents’ that Charapona Macher Kabiraji Jhol aka Charapona Macher Jhol is the epitome of comfort food. I never liked the light fish Curry with loads of veggies and flavored with a typical spice paste while growing up. It was just not my thing! The Spice paste prepared with Coriander, Cumin, and Black Pepper signifies the typical flavor of Kabiraji Jhol. Don’t confuse Kabiraji from “Kabiraji Jhol” with “Fish Kabiraji”. Here Kabiraji stands for a typical type of treatment prevalent long back similar to Ayurveda. 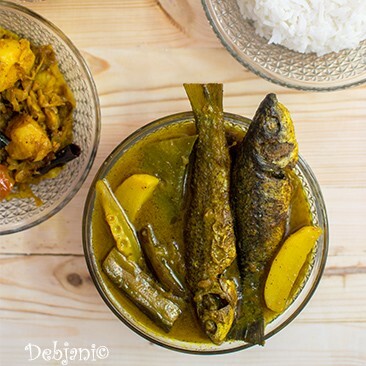 This Bengali Fish Curry is also referred as Kabiraji Jhol given it is considered to be good for upset stomach! In our place, Charapona was quite regular. It was not only for the nutrition quotient but also to cater a big fat family. Charapona was cheaper than Normal Rohu or Katla when purchased in bulk. Needless to say, it was most preferred. In addition, my father and uncles, for some wired reason were adamant having the Kobiraji Jhol prepared with any kind of fish! They used to treat it as perfect dose of Naturopathy! Though the Kids, never ever liked the Jhol! We felt torturous having the dose of Jire-morich-dhoner jhol ( stew prepared with Cumin, Black Pepper, and Coriander). Back then, at home, we had an Odia Cook. His day used to start with making the spice paste using a traditional Shil Nora (Shil batta or Bengali mortar Pestle). I have never seen, use of spice powder at home. We had a heavy-duty grinder at home, however, for jhol, the matriarchs of the family were in preference for using freshly prepared spice paste. Here I must mention, Charapona is actually baby fish (mainly baby Rohu or Katla) and is a bong favorite. They say, baby Rohu or Katla is good for health as the baby fishes are more nutritious. However, while having Charapona, you must know how to get rid of the fish-bones. Now that, I have talked about the fish, spice paste the only thing left is the veggie(s)! Charapona Macher Kabiraji Jhol aka Charapona Macher Jhol was all about using the veggies as much as possible! It basically is a spicy stew prepared with fish and Potato, Eggplant, Broad beans, Raw Papaya, Tomato etc but no onion and garlic. Though, Ginger paste is an important ingredient. I think you can now visualize the Charapona Macher Jhol I am referring to 😆😉 . By the way, taste changes and so does rgean preferences. Now that I am 34 and grown up (!!) love to have the jhol with my portion of rice once in a while! This for sure is surprising for my father to see his daughter now savoring Macher Kobiraji Jhol and in fact, making it at home. A few days back Baba was at ours’ and I cooked a big portion of the Charapona Macher Jhol just the way he likes it (and now I like it). Pasta has never been fussy about food. She, in fact, is more like her father. They simply enjoyed the freshwater fish curry without asking a single word. Baba though shared the funny stories with them how I used to give excuses for not having it. Before Going further with the Recipe! Macher Jhol probably is the most-talked Bengali dish. 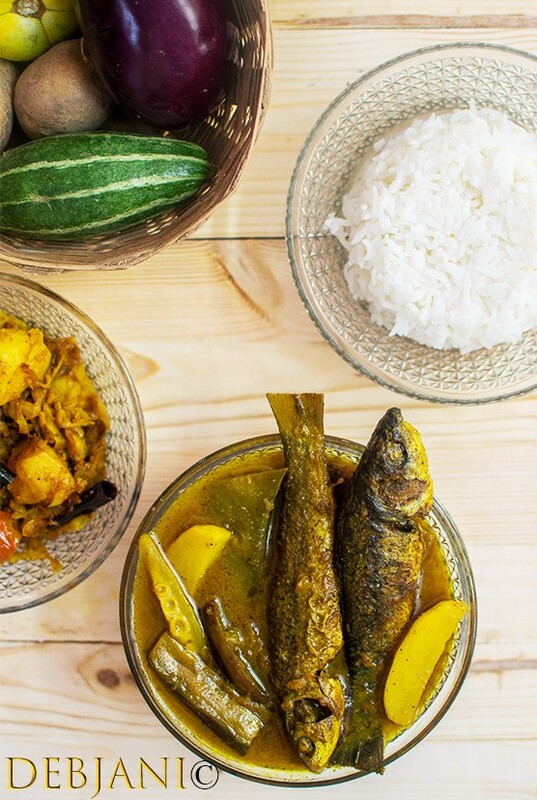 Being Bengali and eating fish are kind of related, you want it or not. Not that, I hate Macher Jhol; in fact, I love my portion of Macher Jhol, that too in different forms/ types. 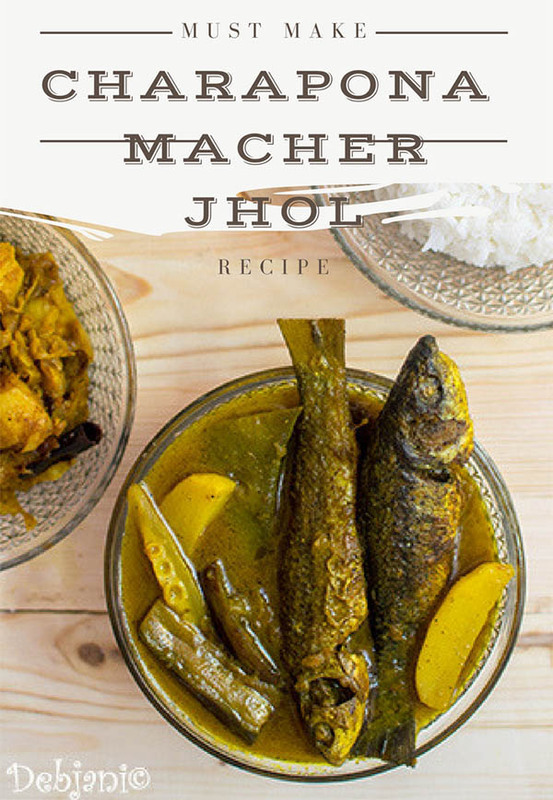 Yes, Macher Jhol, actually is having different recipes and prepared with different fishes. Jhol stands for light curry (or should I say Stew) by the way. The Recipe! (Well, with “The”)…. The recipe for Charapona Macher Kabiraji Jhol aka Charapona Macher Jhol is a no onion no garlic one. Use of Fresh-water baby fish (Charapona) is must and so is the use of veggies. I don’t use the Shil Batta to make the spice paste now instead I used freshly ground spice powder and make a paste with Mustard Oil. Oh yes, this dish calls for Mustard Oil. Bengali Charapona Macher Jhol aka Charapona Macher Kabiraji Jhol is a light, flavored stew prepared with small freshwater fish and veggies. Black Pepper Powder: 1.5 Tsp. Wash and clean the fishes. This recipe calls for whole fishes. 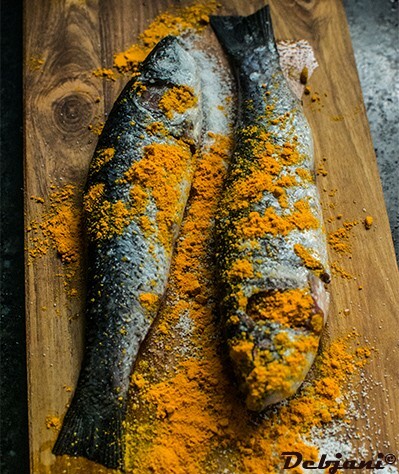 Marinade the fishes with half of the Turmeric Powder and Salt and leave for 10 minutes. Take Cumin Powder, Coriander Powder, Black Pepper Powder and Turmeric Powder along with 1 Tbsp. of Mustard Oil and mix to make a thick paste. If required add little water. Peel the Potatoes and cut into wedges. Peel the skin of the Raw Banana and cut into long thick strips. Cut Eggplant into long stick strips as well. Don't remove the skin. Now cut the Pointed Gourd into long strips with the skin on. Cut Broad beans into thick strips. Cut Tomato into long strips as well. Heat Oil in a pan and fry the fishes from both the side in low flame. Shallow fry potatoes followed by raw banana and pointed gourd and broad beans as well. Sprinkle Turmeric powder over Eggplant and fry those as well. Add Ginger paste and Tomato to the remaining Oil in the Pan and cook till the Tomatoes soften completely. Add the spice paste and Salt to taste and cook on low flame. Now add all the fried veggies except fried pointed gourd and fried eggplant. Add 4 Cups of Water (around 500ml) and cover the pan with a lid and cook on low flame for 10 minutes. 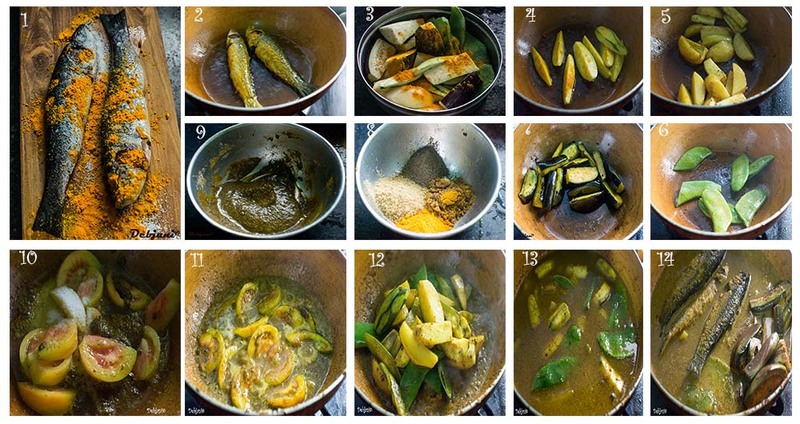 Add Fried Fish, fried pointed gourd, and fried eggplant and cook for 5 more minutes on low flame. Serve Charapona Macher Jhol hot with Steamed Rice. You may use other seasonal veggies while making the Macher Jhol. I use whichever I am available at that moment of time. Lemon Juice is optional, however, gives amazing flavor to the dish. You may increase or decrease spices based on your preference. I add little more Black Pepper Powder and Coriander powder instead of whatever I have mentioned in the recipe. By the way, you may check here in case you don’t want to cook the Macher Jhol but to order it! 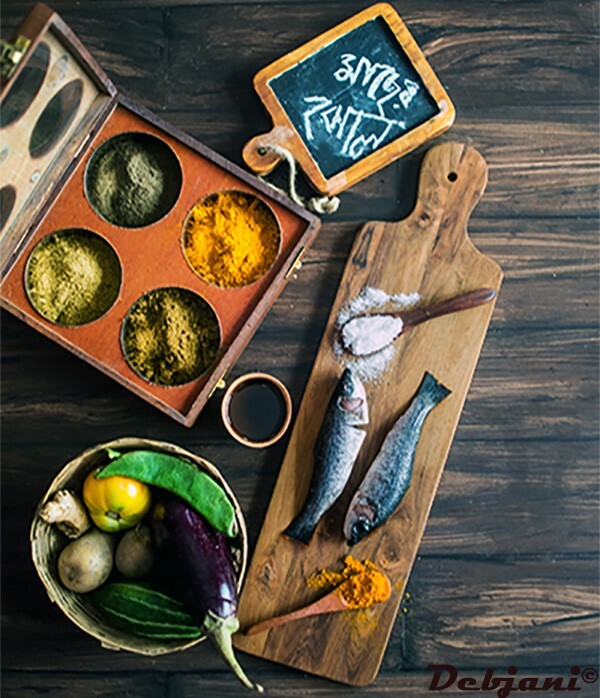 Beyond Macher Jhol and not beyond Macher Jhol, fish recipes from Debjanir Rannaghar apart from Charapona Macher Jhol! Tel Koi | What is the story of Tel in Tel Koi! 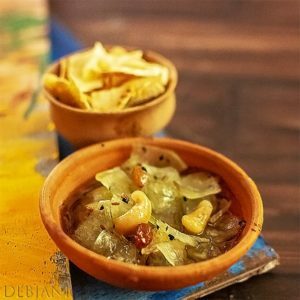 Have you tried the Charapona Macher Jhol Recipe from Debjanir Rannaghar! 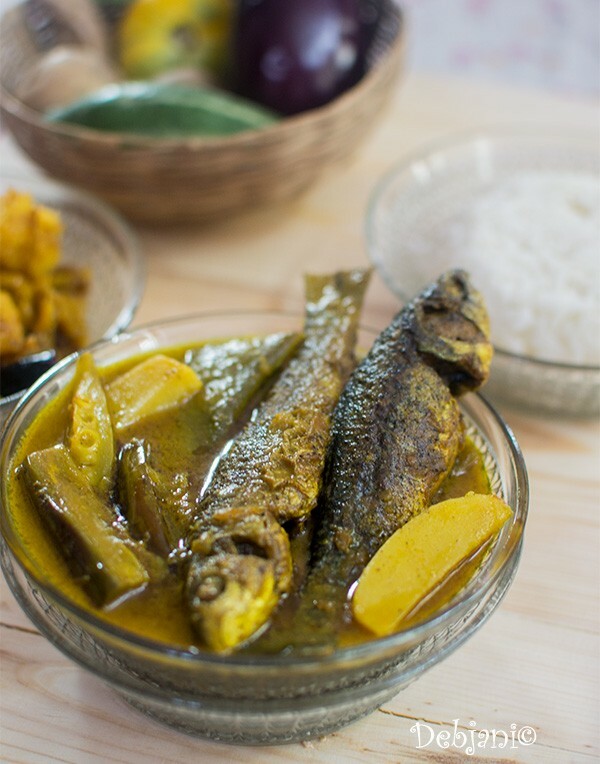 « My take on Nona Ilish & Nona Ilish Bhorta/ Bhuna Recipe from Debjanir Rannaghar!